Interplanetary transport doodah - or networked drive? Data Robotics (Drobo) and BlueArc founder Geoff Barrall's new small biz Connected Data has revealed itself after gaining $6m in A-round funding and cash from a Kickstarter launch. 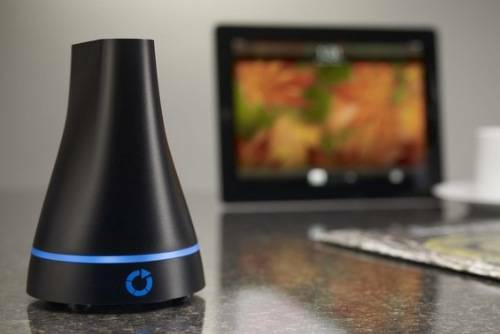 Connected Data's product is the Transporter, a 2.5-inch disk in a small conical desktop package, which copies files to other Transporters in a network, providing file sharing and security within a private cloud. The Transporter hooks up to a router via Ethernet and supports Mac or Windows computers. Barrall is working with staffers who used to work with him at BlueArc and Data Robotics - now called Drobo. Kickstarter is a crowdsourcing funding model in which people pledge small amounts towards a target funding amount within a set time period. Barrall, the founder and CEO of Connected Data, was looking for $100,000 in December to prove the product and commit to its manufacture. In the event the Kickstarter project generated $260,453 as people flooded it, relatively speaking, with more money than it needed. Barrall said: "The fantastic response and uptake from our customers and beta testers is allowing Connected Data to set the standard for what peer-to-peer storage can and should be." What turned them on about the Transporter device? The devices are simple to operate and they inter-operate in a peer-to-peer network. Files are available to a other Transporters in the customer's network or to computers and Internet-accessing mobile devices in the customer's network. Changes to files on one Transporter are copied in encrypted form to to other Transporters in the network. There is no need to back up Transporter files as the network does that for you. File restoration is easy. The main differentiator here is that there's no cloud vault outside your own network. You buy one or more Transporter devices from a network of online and US regional partners and there's nothing else to pay to Connected Data. If a Transporter fills up then stick a bigger disk inside it or buy another Transporter. Read a data sheet here (PDF). What will Connected Data do with its $6m? It's not saying. We can guess the money will go towards further product development and the establishment of a basic company infrastructure.